HBO And 'Game Of Thrones' Haul In The Most Emmy Nominations : The Two-Way HBO got 99 nominations for the 2014 Emmy Awards, the most of any network. HBO's Game of Thrones got 19 nominations, one ahead of FX's miniseries Fargo. 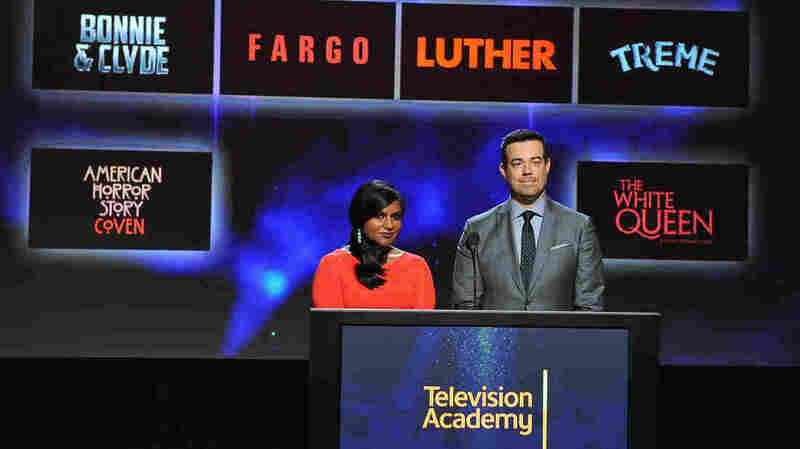 The 66th Primetime Emmy Awards nominations were unveiled Thursday by Mindy Kaling and Carson Daly. Big winners included HBO, for Game of Thrones, and Netflix, for Orange Is the New Black. Cable network HBO has received 99 nominations for the 2014 Emmy Awards, running its streak as the network with the most Emmy nods to 14 years. HBO's Game of Thrones got 19 nominations, one ahead of the FX miniseries Fargo. "HBO also got nominated for its movie The Normal Heart, for its drama True Detective and, in a surprise, for its comedy Silicon Valley. "Other winners included Netflix, with 31 nominations. That's more than double last year, for shows such as House of Cards and Orange Is the New Black. "And the FX show Fargo got 18 nominations. Losers included Orphan Black and The Walking Dead. For those shows, lots of love from audiences didn't translate into any nominations in major categories." Another snubbed show was The Good Wife, the AP says, which "despite a season that was both critically acclaimed and gasp-inducing," came away with only five nominations. The nominees were announced this morning in Los Angeles (see the full list). Orange Is the New Black received the most nominations of any show in the comedy category, with 12. And with 14 nominations for 2014, NBC's Saturday Night Live continued its run as the most Emmy-nominated show in history, with 185 total. Notable shows in the drama category include AMC's Breaking Bad with 16 nominations for its final season, along with Netflix's House of Cards with 13, and PBS's Downton Abbey and HBO's True Detective, which each had 12.